Gravity follows the arrows. Do you know exactly where to drop to be lined up with the little green star in the back? Neither do we. When you play a Video Game, you expect be able to use your skills as a gamer to beat whatever challenges the game throws at you. If the challenges requires a lot of skill, the game is hard to win. If it doesn't require much skill, it should be an easy game. However, some games that should be relatively easy are actually quite hard. It could be due to shoddy programming, a Game Breaking Bug, poor implementation of gameplay elements or time constraints, but the developers threw in something which makes the game harder, but which has nothing to do with the player's or AI's skills. This is fake difficulty. Bad technical aspects make it difficult. Making a difficult jump is a real difficulty. Making a same difficult jump with overly complex controls, bad jumping physics, or an abrupt mid-air change of camera angle - and therefore the orientation of your controls - is fake difficulty. Denial of information critical to progress. A reasonable game may require the player to use information, clues, or logic to proceed. Witholding relevant information such that the player cannot possibly win without a guide, Walkthrough or trial and error is fake difficulty. Also includes hidden Unstable Equilibrium (e.g. a later level is much harder if you do badly at an early level, and you're not informed of this ahead of time). In a 2D game with no camera control, hiding important details behind foreground elements or Behind the Black counts as fake difficulty if your character should be able to see them. The game requires the player to use skills or knowledge that are either incorrect or have nothing to do with the genre. A football game that requires you to describe the position that Jerry Rice played for a power-up is real difficulty. A football game that forces you to do multi-variable calculus in order to train your starting lineup is fake difficulty, not to mention just plain silly. It is important to note that just because a gameplay feature is annoying and frustrating does not make it fake difficulty. For example, placing a large number of invincible minor minions between the player and the Plot Coupon is extremely annoying, but they can be avoided by skilled movement - thus, the difficulty is real. Note also that fake difficulty is not inherently bad. If used subtly, it can provide a satisfying challenge in cases where the AI might be lacking. However, it is obviously preferable for the AI to provide a challenge by playing well than by getting special advantages from the programmer. Moreover, some games (notably Platform Hells and Retroclones) get the majority of their comedy/nostalgia from Fake Difficulty and is much of the appeal of them - Dungeons & Dragons' most popular module is packed to the brim with Fake Difficulty and attempts to reduce it have caused complaining from the fanbase. Fake Difficulty was prevalent in many older games, when developers were still learning about how to make fair challenges. When people realized that sometimes, the game was hard for all the wrong reasons, they decided to make it more of a fair challenge. The unfortunate side effect are that newer games seem easier in comparison merely because they're a fairer challenge. There are plenty of other reasons for this (Such as players being aware of some persistent forms of Fake Difficulty and making sure to avoid them) but that's another article entirely. It still does exist today, mind you. See also Fake Longevity, Classic Video Game "Screw You"s. For its cousin, see Fake Balance. For the player variant, see Fake Skill. A bug which renders the game unplayable. Games with unintuitive, complex, or difficult control systems. Randomly Drops - if the items are necessary to continue the game. If you don't know how to do a Shoryuken because you didn't read the manual, that's just you being lazy, not Fake Difficulty. This is for games which refer to plot elements or instructions that are only in ANOTHER game's manual which you haven't purchased yet. If objects that reside in the "background" layer can still kill you by Collision Damage. In isometric views, it's hard to tell what's blocking you or what's safe to land on. Where the area around a character/enemy that registers hits doesn't match up with the actual appearance of the character/enemy – the game registers hits that don't visually connect, or fails to acknowledge hits that do. 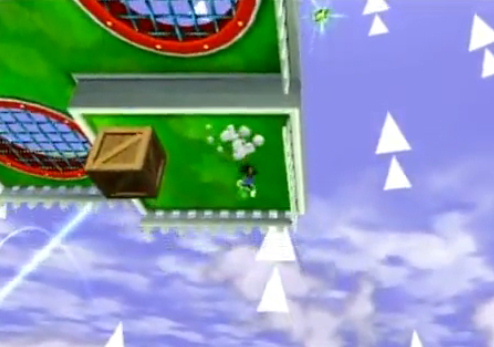 A hole in a platform game which, despite appearances, is not bottomless. The only way to find out is to jump in! When joining an online game, there are a lot of unwritten rules that fellow players expect you to know that the in-game tutorials do not explain. Probably the worst cause of Guide Dang It. This is when the game gives you information, but it's not simply inaccurate. The computer is outright lying to you. A "missable" item which, if you didn't get it on your first chance, will be unobtainable afterwards. Doubly frustrating if it's a very powerful item that will aid the quest, and sure to cause a lot of frustration if it's a key item, primarily required for the best ending. Extremely likely to cause controller-tossing if it's a key item required to get any ending at all. If the Nonstandard Game Over screen/cinematic lets you know what you missed for your next go-around, then the Fake Difficulty of the situation is slightly lessened. It'd still be better if they told you about it before it was Lost Forever, though. A gameplay design element that in the future will prevent the player from winning, but the player may not be informed of this until hours after it happened. A game's solution requires an answer that is blatantly incorrect in the real world, causing players with the true answer to get stuck at the puzzle. What the—why is this Visual Novel suddenly making me play a rhythm game? ↑ Here's a hint: the spin jump is your friend. This page was last edited on 10 April 2017, at 09:22.